These are the different options of going around Kuala Lumpur. 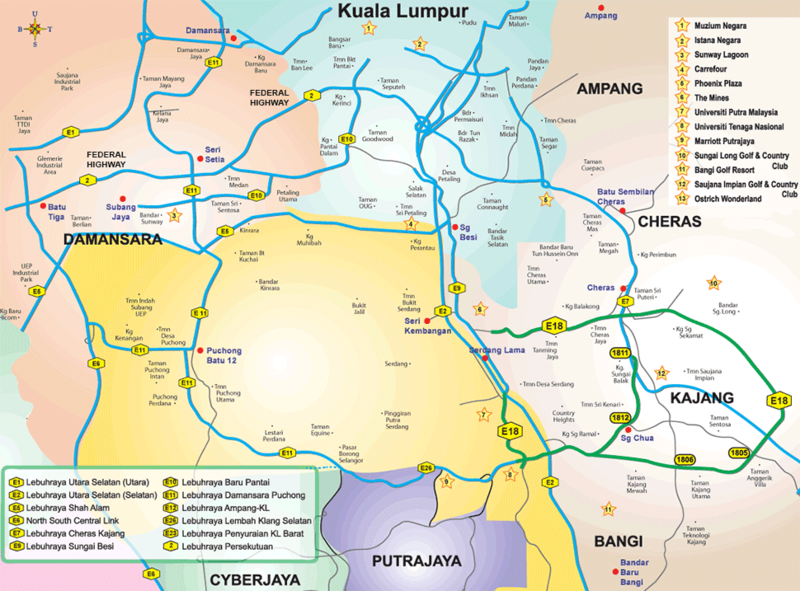 To find out how to get to Kuala Lumpur, look here. Kuala Lumpur has a very well-integrated highway system. However, majority of these highways are a paid per entry type of highway. The travellers who choose to use private transportation should put into mind the toll fee in addition of the petrol cost. They can save some money if they ride the motorcycle because motorcycle is exempted from paying the toll fee. The rail line services and bus service in Malaysia are under the umbrella of MyRapid managed by the same company called Prasarana Malaysia Berhad. Only one rail line service is managed by KTM Berhad which is KTM Komuter. Therefore, all the routes are well connected to each other. MyRapid provide rail services like LRT, MRT and monorail. It also operates BRT, which similar to bus service but has its own track instead of sharing the route with other private vehicles and RapidKL bus service. MyRapid offers travel pass for tourist called KL Travel pass for the travellers to use the public transportation for free for two days. The pass is also inclusive of the KLIA express ticket. Cycling is not a number one choice when it comes to exploring the city. The weather is quite hot and humid during the day. One tends to sweat profusely due to the intense physical activity like cycling. However, it is still doable to cycle. The local council has designated certain part of the road for cyclist. The designated lane is painted blue and the length is 7.2km long. Other vehicles are prohibited to use the lane. Rail train Services also allow foldable bicycle inside the train coach. The length and height should be no more than 200cm long and 120cm high. The bicycle also must be in a clean condition. Frequent bike users find cycling around the Kuala Lumpur city a challenge. The risks posed by cars, motorbikes and even pedestrian, with whom they occasionally share walkways make the cyclist vulnerable. The people of Kuala Lumpur are still not used to cycling culture, so motorists aren't used to dealing with cyclists. There is also an issue regarding illegally parked vehicles obstructing the bicycle lanes, thus creating a safety hazard for cyclists. Image by The Star Graphic.